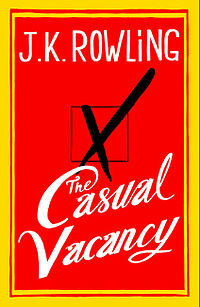 My favourite book from 2012 was The Casual Vacancy by J.K. Rowling. I know I like a book when I can't sleep. I either stay up way too late reading page after page, or I wake up in the middle of the night thinking about a part of the story. With this book I did both of those things. The plot surrounds a small town council, an empty council seat, and all those involved in vying for power. The plot initially reminded me of Game of Thrones, but instead of seeking the Iron Throne, these characters are fighting to be elected to local government. Not all the characters are likeable, and there are a lot of bad things happen, but I couldn't put the book down. I think this book works because Rowling is such an excellent storyteller. Each page made me want to know more about these people and made me anxious for what could happen to them. She even made me care about characters I didn't like, which I find amazing. There are some heavy themes in the book, including domestic violence, child abuse, drug addition, mental health issues, poverty, and classism, but these themes didn't make it any less enjoyable to read. Rowling writes in such a way that despite the tragic elements, I was still enthralled by the story and desperate to know how it would play out. The Casual Vacancy had the potential to be a complete disaster, and I'm filled with "Team Rowling" pride that it wasn't. Writing anything after of the success of Harry Potter had to be a gamble, especially in a different genre, and the pressure for it to be 'good' had to be great. Not everyone liked the book, but I really enjoyed it and I applaud Rowling for having the guts to go for it and try something new. It find that very inspiring. This book review was part of the Author Appreciation Day Blog Hop, happening over at Book Reviews by Sus. You are the first person I've heard of who loved this book. It's so nice to finally see a good review of it! I haven't picked it up yet, but now that I've read your review, I'll have to. Thanks for joining the blog hop! Haha. Susie! You stole my comment. I was going to say THE SAME THING. I've never heard anyone say they loved this book, let alone like it. I think I might read it now. Thanks for the review! I had been skeptical of it, but I should definitely check it out. I love when a book is a good read. The Internet Told Me What To Bake!